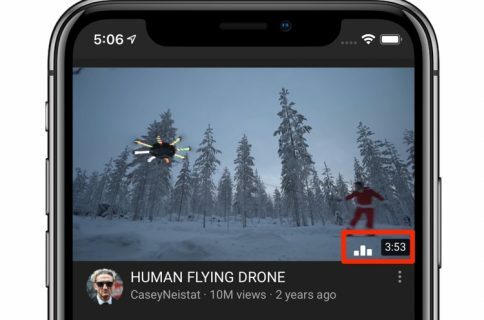 Google’s official YouTube for iPhone and iPad app has picked up a trio of compelling new features in its most recent update on App Store. Bumped to version 12.03, the free of charge software adds handy Chromecast controls to Control Center and your iOS device’s Lock screen, and to your wrist via Apple Watch. 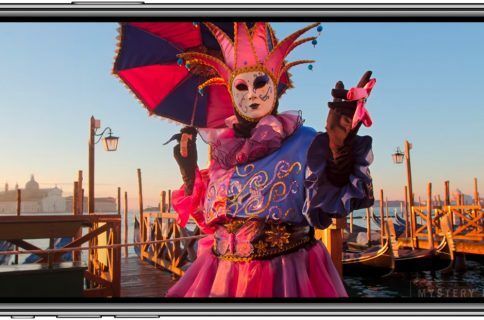 The playback controls only appear when you’re streaming videos from Chromecast devices, smart TVs, game consoles or any other living room devices that run the YouTube app. 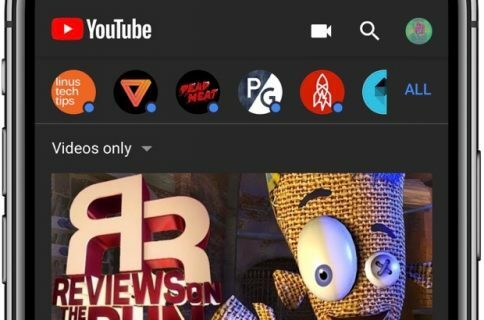 The best thing about this new feature is the fact that you can safely put your device to sleep once you cast a video to a Chromecast device, smart TV or another streaming device provided it has the official YouTube app installed. You cannot start or stop casting from the Control Center—it needs to be done from inside the YouTube app. As soon as another device starts streaming the video, the YouTube app on your iOS device stops downloading data. To pause the video playing on a streaming device, simply wake your device from sleep and up pop familiar playback control to pause or continue the video, jump to the previous or next video in the queue (unless YouTube’s autoplay Up Next feature has been disabled) and increase or decrease the volume on the TV or monitor your Chromecast is hooked up to. These controls are also available in iOS’s Control Center and on your Apple Watch. I was a bit bummed that playback controls are still pretty basic when streaming to Apple TV. 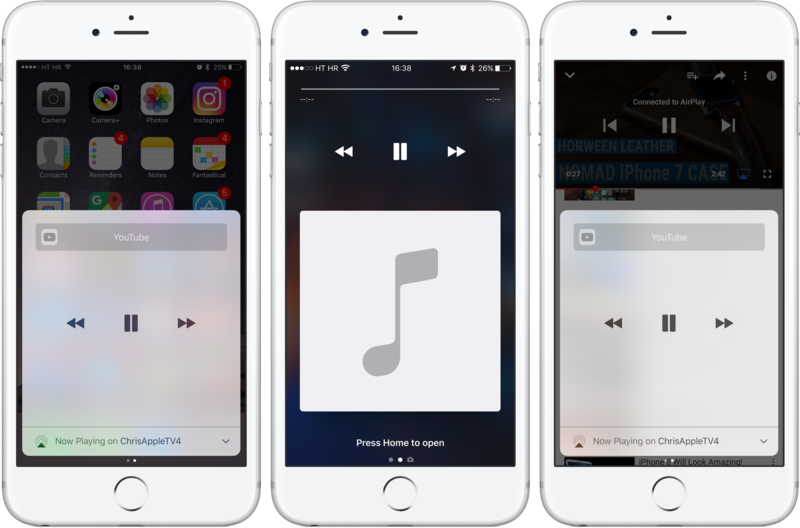 In that case, you won’t see YouTube’s volume control, scrubber, video description and thumbnail graphics in Control Center or on your Lock screen. 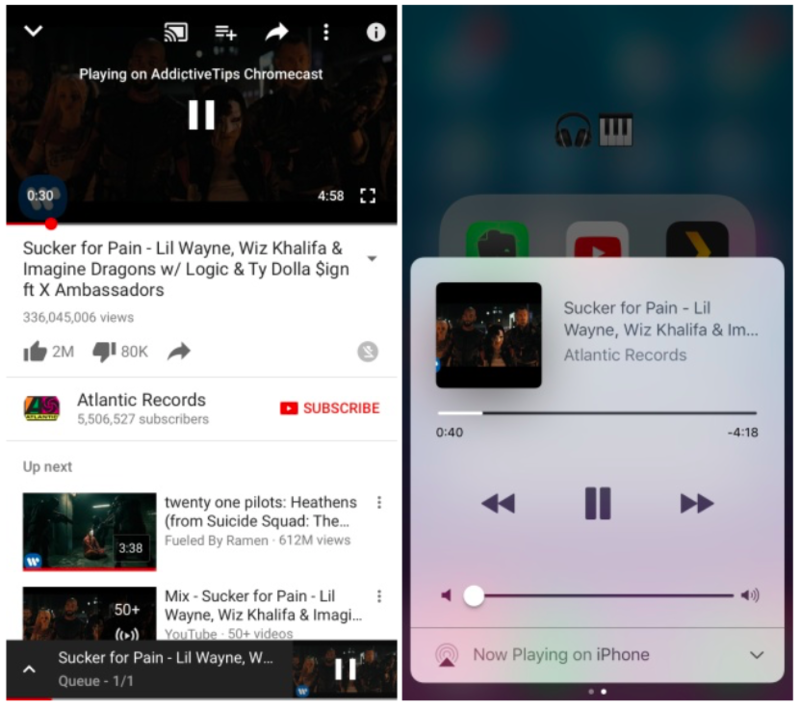 Compare the design of YouTube’s Lock screen and Control Center controls when casting to a Chromecast device (top of post, via AddictiveTips) and Apple TV (above) for yourself and you’ll see what I mean. Grab YouTube for iOS for free from App Store.